It is always fun to interact and explore the city with a local food enthusiast. In Ajmer I met Shikha, a dentist by profession and food instagrammer by passion. She runs an instagram account Ajmerfoodie. Together we explored the lanes of the city, with her being an excellent guide. 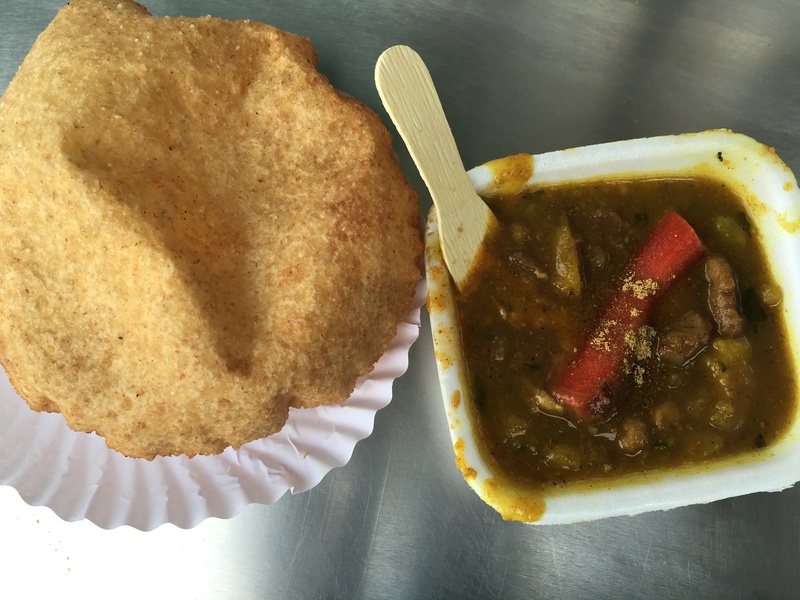 We started with Dhanna ki Kachori in Vaishali Nagar– a super spicy dal kachori with kadi. She remarks that this unique combination of Kadi and Kachori was invented in Ajmer and spread to other towns slowly. But the kadi is made in a different style without buttermilk or curd. Having been in existence for 20 years, the shop is run by two brothers Durgesh and Kanahiya. The kachoris are topped with mashed potatoes and coriander. To add a tangy flavour to the kachori, lemon wedges are served along with it. From here we reached Akbari Museum. Next to the Akbari museum in Ajmer are two shops facing each other – Shankar chaat and Anant Jain lassi shop. Shankar shop is famous for kachori and saakhe. As we already had the kachori at Dhanna, we ordered saakhe with kadi. Saakhe is just fried maida dough with ajwain. Curly in shape, saakhe is also known as namkeen or matar in different cities of India. I had always enjoyed it with a cup of sweet tea. This was the first time I tried it with kadi and chutney. A great combination indeed- the crispy saakhe went well with the smooth and spicy kadi. Next, we tried lassi at Anant jain lassi shop. 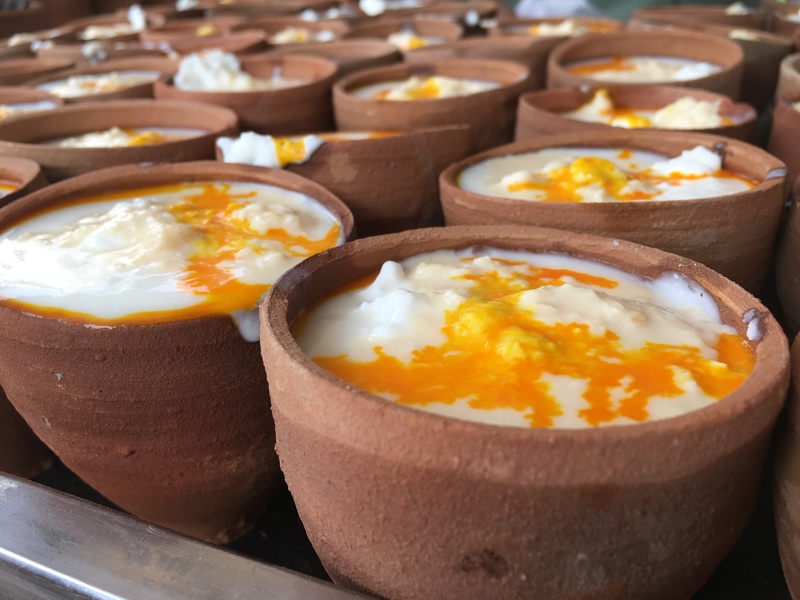 The thick and creamy lassi is served in a clay glass topped with malai, rabri and saffron water. In the heat of Ajmer, it was a perfect refreshing drink. Ajmer is known for Sohan Halwa and karanchi halwa. I am sure there would be some historical relevance to the sweets in Delhi and Ajmer. In Old Delhi, sohan halwa is available in selected sweet shops like Chainaram and kanwarji. I simply love this caramalised crunchy chewy sweet biscuit. It is made up of wheat, ghee, sugar and nuts. One small bite of halwa and the mouth is literally filled with ghee. Slowly you get the flavours of nuts. Moolchand Buddhamal in Purani Mandi is the oldest sweet maker of ajmer. Established in 1870, the shop has the best sohan halwa in the old city of ajmer. The sweet is also available in dargah market at all the sweet shops. The story of bhutia halwayi (ghost sweet maker) is interesting. One story is that the ghosts used to make sweets whole night and when the owner used to open up the shop next day in the morning, all the sweets were made. Second story is that the sweet shop was in an isolated lane on Alwar gate road. No one used to visit that lane at night because of the rumour of ghosts living in Alwar gate road. But lala ji used to open the shop inspite of rumours of ghosts in that area. That’s why the locals started calling it Bhutiya halwai shop. Whatever the real story, the sweets are really good specially doodh jalebi and gond ke laddu. We tried doodh jalebi. The sweet and sugary jalebi is crushed in a steel jug and then half a glass of thick milk is added. Both of them are mixed properly and served in a clay glass with cream on the top. The mix of soft and crunchy jalebis makes it special. It is not easy to find authentic homestyle Rajasthani delicacies in restaurants. 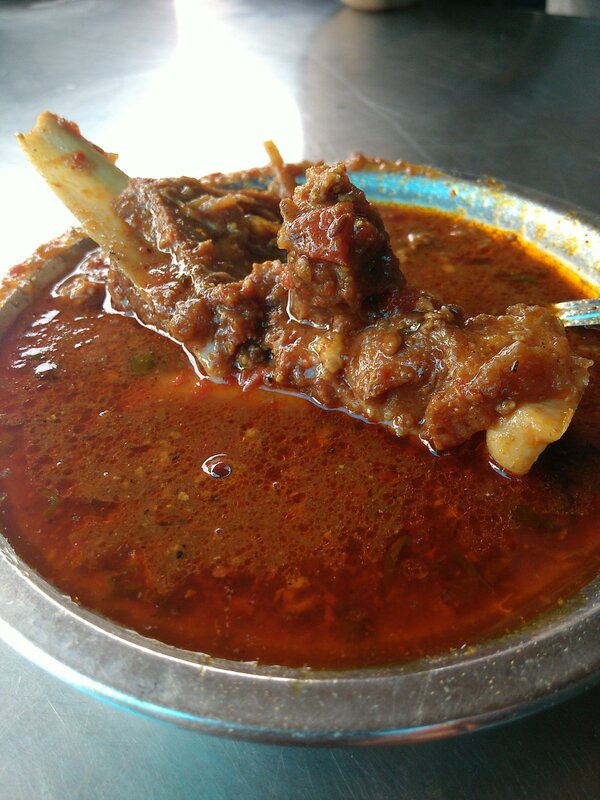 Mahadev dhaba is one of the local eateries in Ajmer where some of the Rajasthani dishes like gatte ki sabzi, ker sangri, sew tamatar, papad sabzi are on the menu. The dhaba is at Nasirabad road in Ajmer.The owner specially cooked sew tamatar and papad ki sabzi for us and allowed us to oversee the preparations in the kitchen. The recipe of both of the dishes was similar- first, in hot oil, onion is sautéed and garlic water is added to it, then curry gravy, some garam masala and finally sew or roasted papad are added. In my opinion, what makes it special are the two ingredients – garlic water and the curry gravy made up of malai. The malai in the gravy leaves a smooth creamy texture to the sabzi. A bit spicy for me, but It went well with the fresh tandoori roti. O n the way to our last stop for faluda, near madar gate, we spotted probably India’s biggest kachori weighing 650 gms. In the end we decided to stop for some dessert. 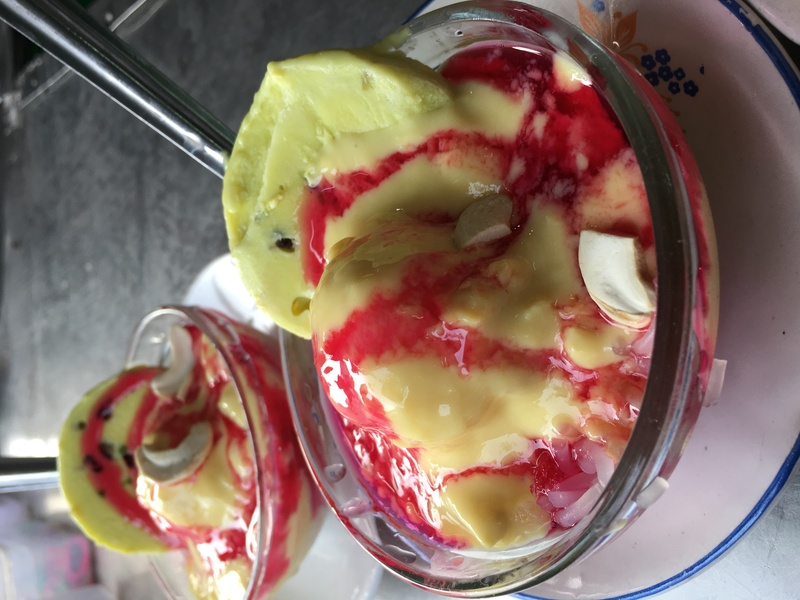 Kesar pista kulfi with kesar pista ice cream, rabri, dry fruits and rose syrup were layered and served in a glass bowl. It was the perfect sweet way to end the Ajmer street food journey. The evening was spent in the Dargah of Khwaja Moinuddin Chisthi. Hazrat Khwaja Moinuddin Chishti, popularly known as Garib Nawaz (helper of the poor), is a giant figure on the Sufi map of the sub-continent. Situated in the city of Ajmer in Rajasthan, the shrine is open to all faiths. It is an old saying that people who visit Ajmer Sharif and pray with pure faith and loyalty at this Dargah, are granted their heart’s wishes. In the Dargah there are two huge degs i.e., cauldrons – for cooking Niaz (purely vegetarian food); cooked with rice, ghee, nuts, saffron & sugar. The system of cooking food in cauldron was first introduced by Emperor Akbar. And Ajmer sharif has the world’s largest cauldron with the capacity to cook 4800 kgs of food in it. I participated in the langar with the locals and the devotees. In a big plate, fresh and delicious biryani and sweet rice were served. People kept sharing the food from the same plate. It was truly an experience of a lifetime! 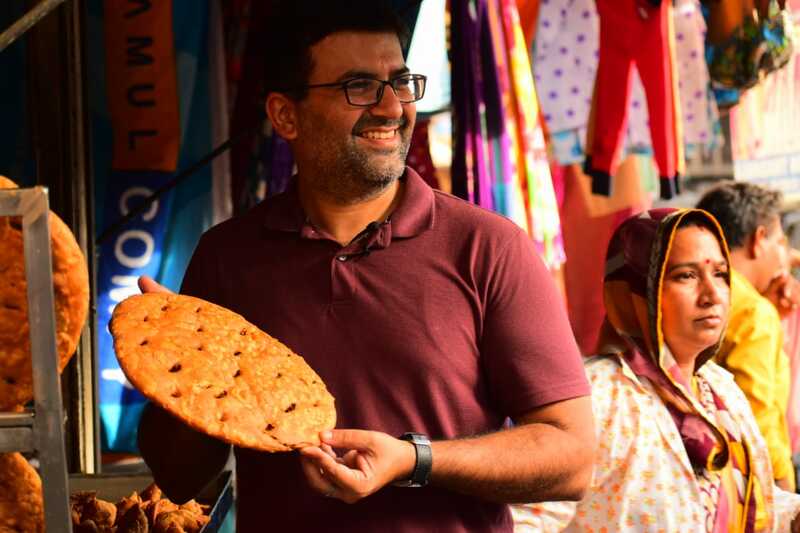 Pushkar is an ideal place for a street food walk. The whole city can be covered in a couple of hours on foot. Infact, if you walk closely observe your surroundings, there is a chance that you will start recognising the faces of the locals. This is what happened with me when I visited Pushkar last week. After one round of the city, I can recall and recognise most of the places and people. That’t the beauty of this small city. 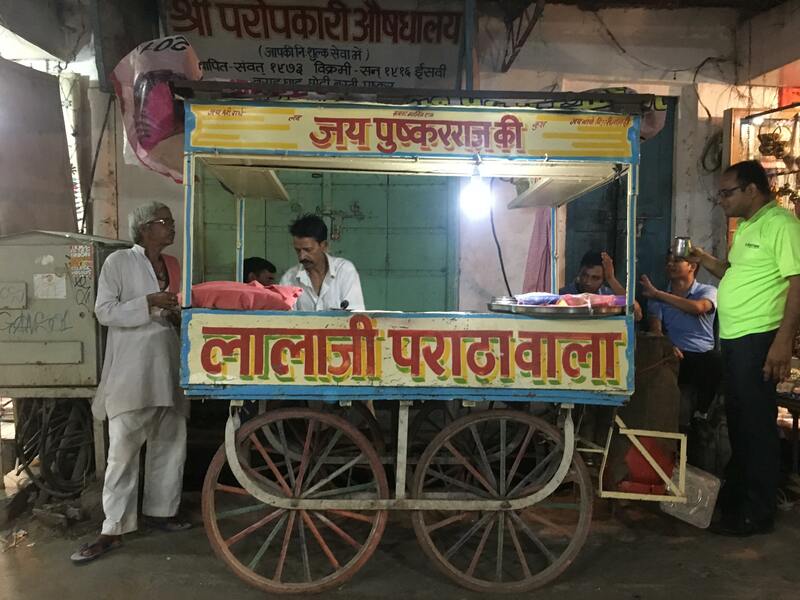 While most of the blogs talk about the cafes in Pushkar, I was quite sure there is going to be some unexplored street food of Pushkar to be unearthed. Like most of the temple cities in India, Pushkar too has amazing street food. I walked and walked and walked from morning till evening, all the while talking to locals and trying a delicious array of street food. The journey started with Pushkar Breakfast Corner near varaha ghat. 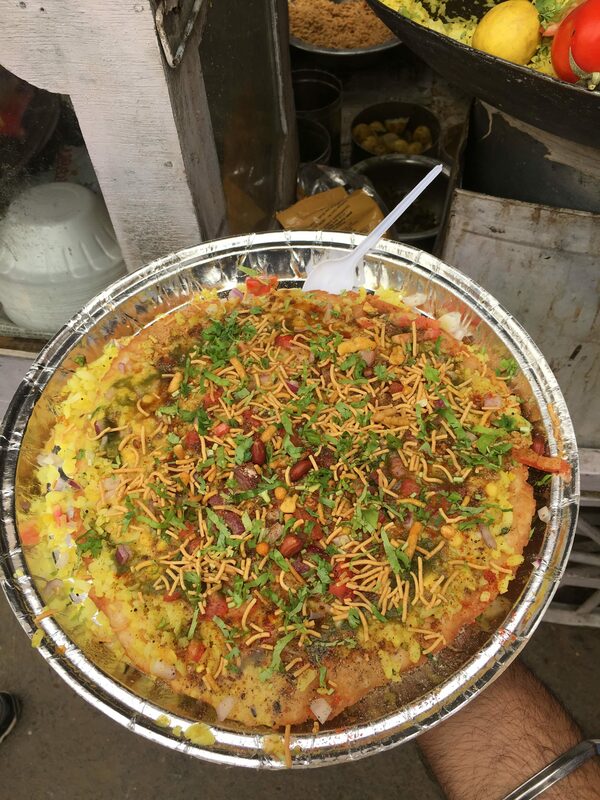 A street food cart that sells Pizza Pakwan i.e., poha with mathri and dal – this was a perfect example street fusion food. Dal Pakwan is an authentic sindhi breakfast dish where big sized mathri, made up of maida is served with dal. And poha – flattened rice, cooked with mustard seeds is a famous breakfast of north India. Pushkar breakfast corner shop simply combined both of them – dal pakwan and poha, and named it Pizza Pakwan. The base is of mathri, over it he evenly spreads poha, then adds dal, and tops it with sew, namkeen, onion, chutney, chaat masala and fresh coriander. It was a simple twist given to the dishes, which made it taste great. The crunchiness of the mathri blended perfectly with the light and fluffy poha. The crispy additions on the top like fried peanuts and sew added a spicy twist to it. The shop opens at 6 am and everything gets finished by 12 noon. The pizza pakwan is priced at Rs 30. 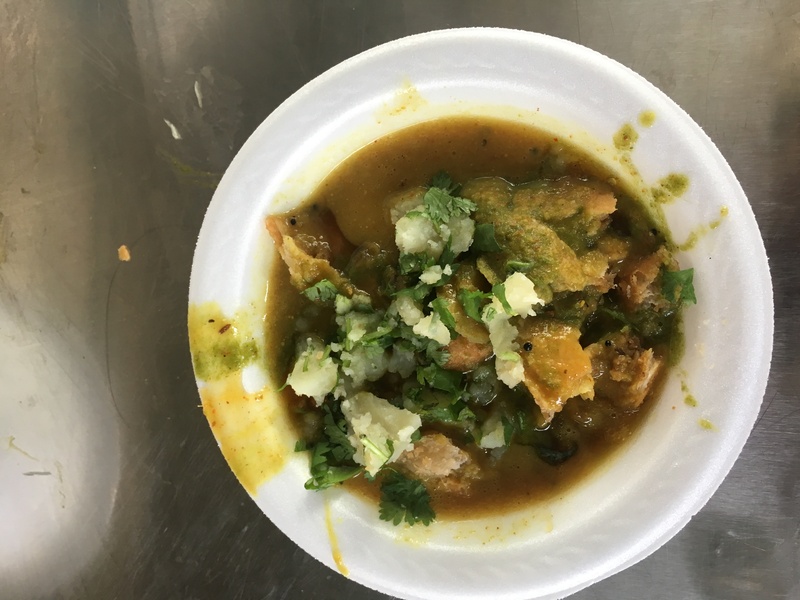 Just on a walking distance is another shop that opens up only in the morning time– Pushkar chaat bhandar- mohan ji bhujia wale famous for pakodi, which is also known as bhujia here. The shop is run by father son duo mohan ji and kamal. It is sold by kilograms at 200 per kg. Normal small size pakodis (fritters) of spinach and besan are topped with kadi (not to be confused with curry). The way kadi is prepared in this part of Rajasthan is completely different from other parts. There is no use of yoghurt or buttermilk in it. It is simply made up of besan and water. The combination of kadi with pakodi is quite unique to Ajmer district of Rajasthan. In Bihar, I had tried kadi with samosa. This was a really fulfilling meal. The fresh crisp pakodis with plain kadi were a perfect breakfast. After having kadi pakodi, we tried kachori with mango chutney at Ugma ji shop. The dough of refined flour is stuffed with dal ki pitthi to be deep fried in oil. What made it special is the thick mango chutney served with kachori. The kachoris were crisp and flaky. Pushkar can be named as the city of Malpua. You can spot a malpua shop in every nook and corner of the city. There is a dedicated lane for sweet sellers in Pushkar near Gau ghat- Halwai gali or the street of sweet makers. 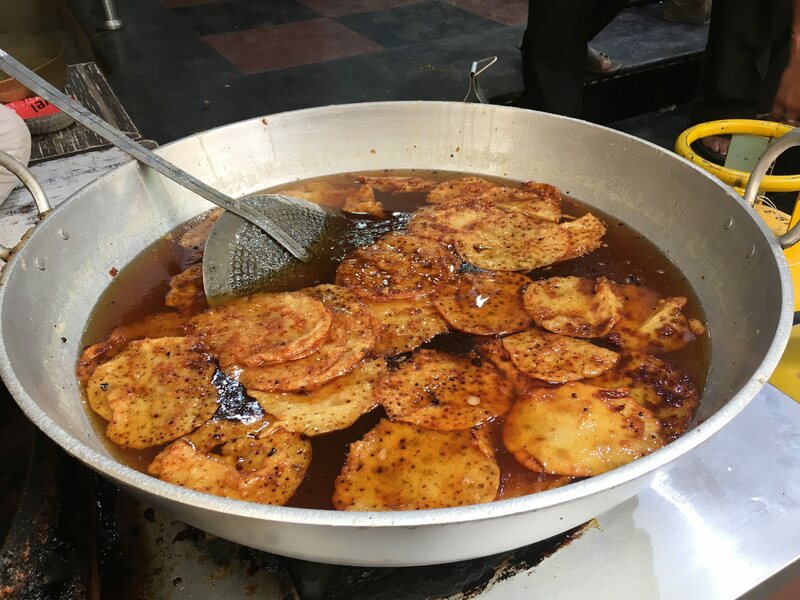 To make delicious malpuas, first the batter of white flour is prepared; Second, it is poured and deep fried in oil; third, the cooked malpuas are soaked in sugar syrup. What makes Pushkar malpua special is the rabri malpua. Instead of adding water to the batter, condensed milk is added to give it an amazing nutty taste. The most popular shop in Pushkar is Sarvadia mishthan bhandar in Halwai gali. After having malpua at Sarvadia misthan bhandar, we went on to try Laffa at Ganga restaurant. The whole city of Pushkar is known for religious tourism and leisure tourism. There are cafes and restaurants catering to people from all over the world. Most of the foreign tourists are from Middle East and they have somewhat influenced the street food as well. There are 3 shops next to each other selling falafel, hummus and other middle eastern food. The most famous dish is the laffa- a wrap stuffed with hummus, falafel, garlic sauce, mushroom, onion, tomatoes, potato wedges, pepper, salt. Cooked in Olive oil, it was a delight to watch the preparation. And the taste was simply amazing. The other dish we tried at laffa wala was the pizza roll. It was the same filling with loads of cheese except falafel, hummus and potato wedges. Next, we went on to try the golgappa at a street cart with 6 different flavours- regular (mint and jeera), garlic, cumin, mint, hajmola and lemon. My favourite was lemon- a truly refreshing water with the right spices. 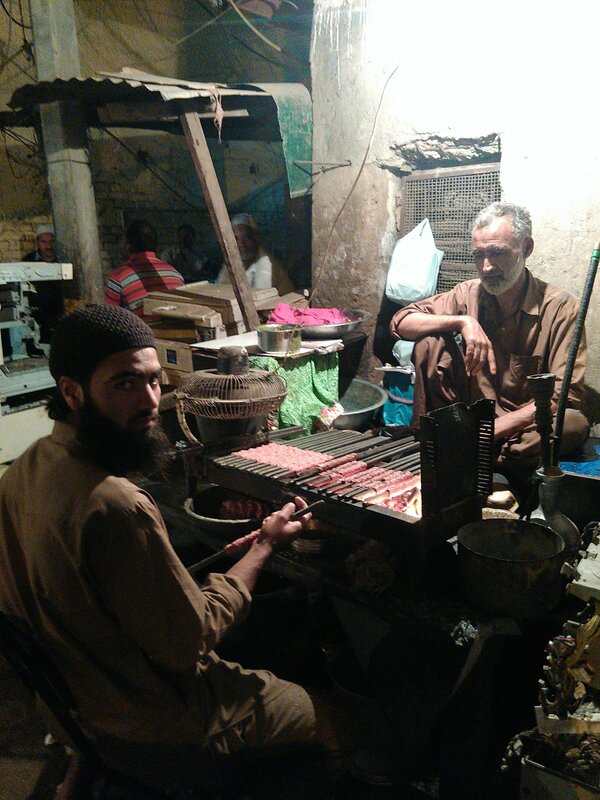 The next stop was Lala ji ke parantha cart. It can be spotted anywhere in the lanes of Pushkar after 7 pm till 12 midnight till the stock lasts. This was the best parantha I’ve ever had. I tried the mix vegetable cheese parantha. The stuffing of the parantha consists of mashed potatoes, sew ( namkeen), onion, paneer,cheese, spices. The paranthas are first pan fried in butter then in ghee. There are cooked properly and cut into small pieces with the help of a pizza cutter. The paranthas are served with a dip made up of yoghurt and garlic. The cost of one parantha was Rs 120. The last food stop was Makhaniya gulkand lassi at Kumawat lassi cart. 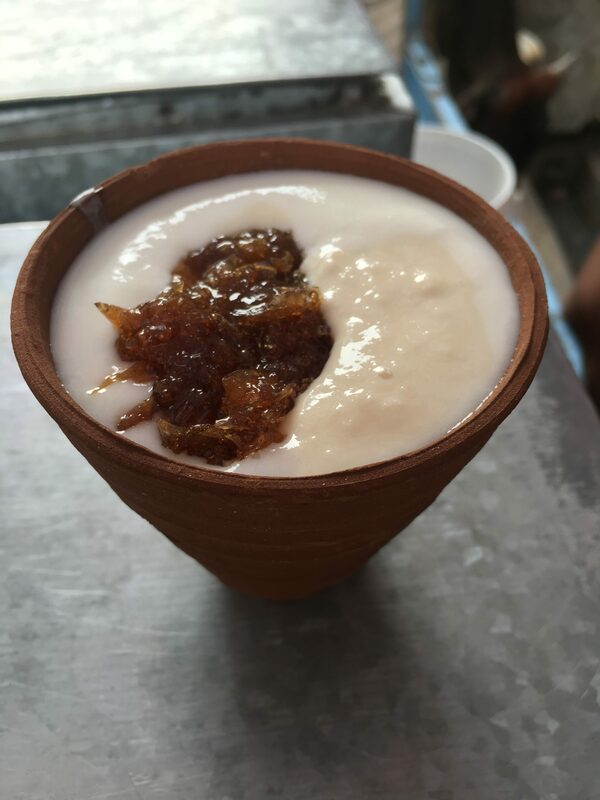 At kumawat lassi cart, the thick lassi is topped with cream, rabri and gulkand (a blend of rose petals, sugar and spices ). Priced at INR 30 and served in a clay cup, it tasted divine. Sweden se aaya mera dost! My foodie friend, who is also a neighbor, runs an Indian food truck in Sweden. Ever year, around Diwali, he visits his family in Delhi. However, more than this, I believe his visit is more about experimenting at newly opened eateries and catching up with the old ones. The other day, we met and discussed the food in Delhi at great length. After a brief question-answer session, he took me to ‘Baldev Dhaba’ at GTB Nagar Bus Depot. The place is rustic. The dhaba is on the pavement. At one end, stands Baldev and his brother Kishan with a big Patila of keema mutton and at the other, are the benches. It was great to see the hungry souls, majority being bus and auto drivers, sitting and screaming with rejoice, for a plate of keema mutton and tandoori rotis. This place made me recall another eatery that used to be in Ghanta Ghar by the name of ‘Moti Dhaba’ where we used to devour keema gravy with innumerable rotis. Unfortunately, Moti Dhaba is closed but Baldev is running in full force. The dhaba was started in 1960 by Late Narayan Das Sachdeva and later his two sons Baldev and Kishan took over it and introduced the most popular dish, ‘Keema Mutton’ in 1974. 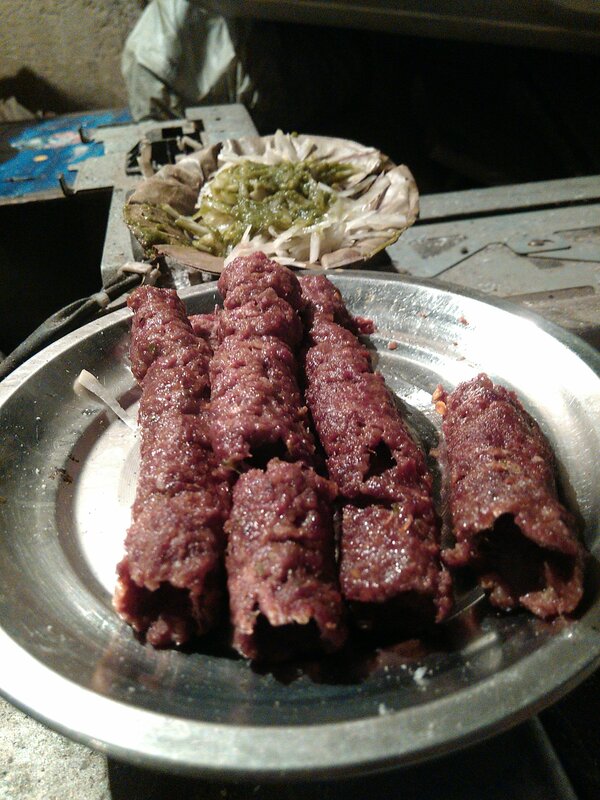 The keema mutton is priced at Rs 140- 2 pieces of mutton in a small plate are served with rotis. After gobbling up over 10 rotis, all we had to pay was a meager Rs. 30. Over a plate of mutton, Baldev sprinkles some homemade garam masala and serves it straight to the soul with crispy tandoori rotis. Even though the gravy appears to be very spicy, being bright red in color, the spices were just right. The red colour is just a result of the tomatoes used to make this flavourful dish. The minced mutton gravy with pieces of mutton on bones was excellent. 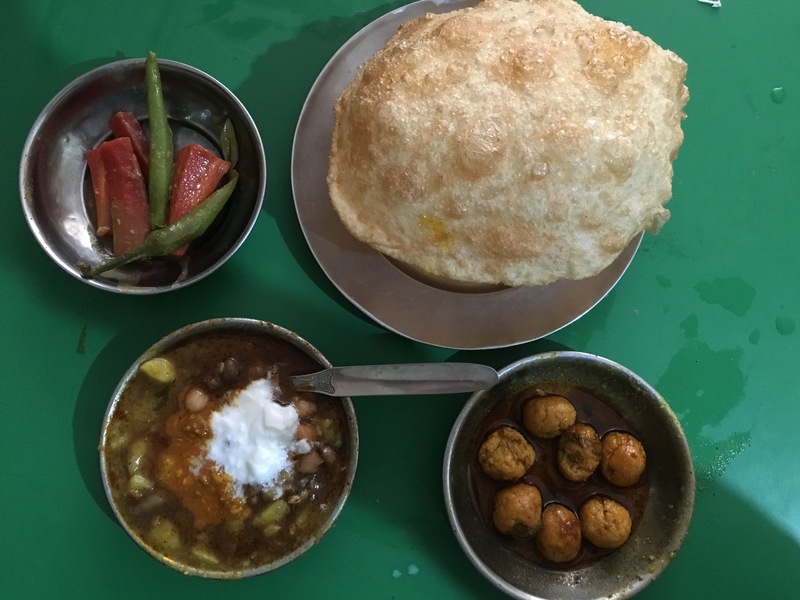 Baldev dhaba also has vegetarian dishes- chana dal, matar paneer, kadi, rajma – all priced at Rs 20 for half a plate and the rotis are Rs 3 per piece. 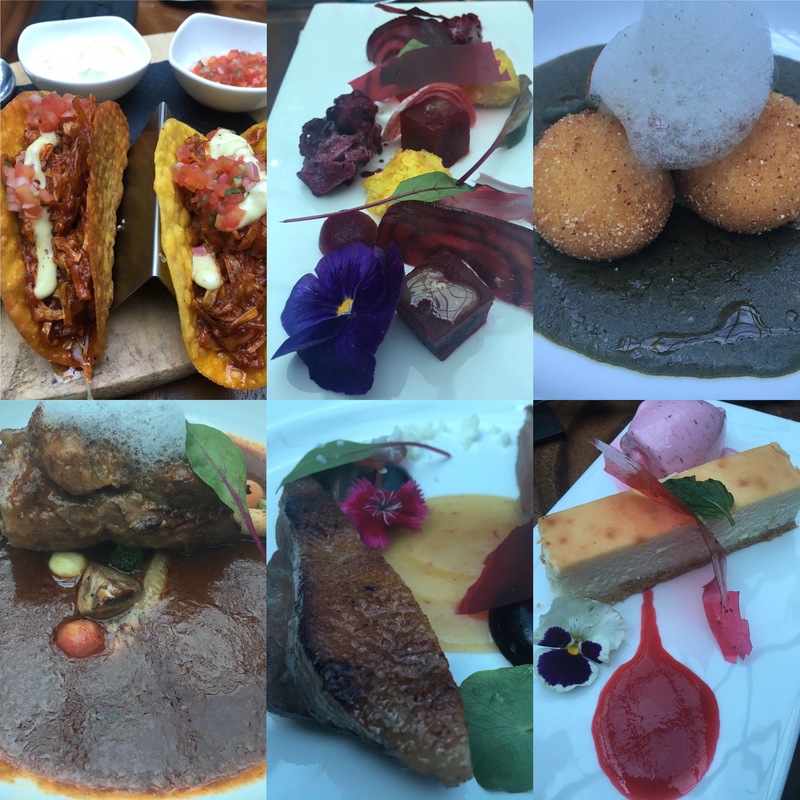 I mopped the plate filled with gravy and came home satisfied discussing with my foodie friend about the myriad of new options in the food market. In the coming days, I am sure we are going to explore more! And eat even more!